The Grungy DeathBot is a Mouse DeathBot with a blueprint skin applied. This Deathbot, painted up for our loyal hunters, gives you that gritty, post-apocalyptic feeling while hunting, without leaving the comfort of your own dimension. The Grungy DeathBot is not sold by any Trapsmith. It can only be crafted given the proper ingredients. A complete list of DeathBots can be found here. 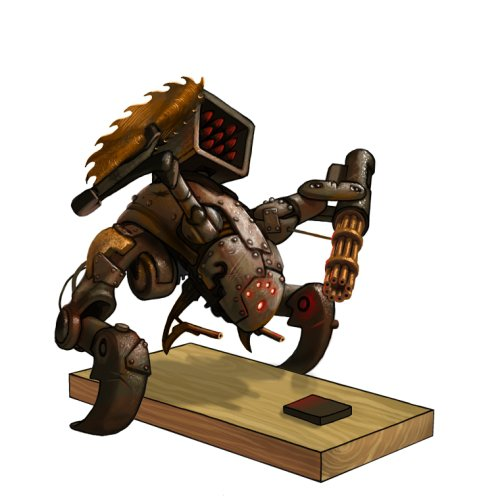 11 November 2010: The Grungy Deathbot was introduced with the start of the King's Giveaway event. 23 September 2011: The trap skin system was overhauled and the Grungy Deathbot Skin was changed to the Grungy DeathBot Blueprint. This page was last edited on 27 January 2019, at 00:59.